Christmas Mass inside St. Peter's Basilica. 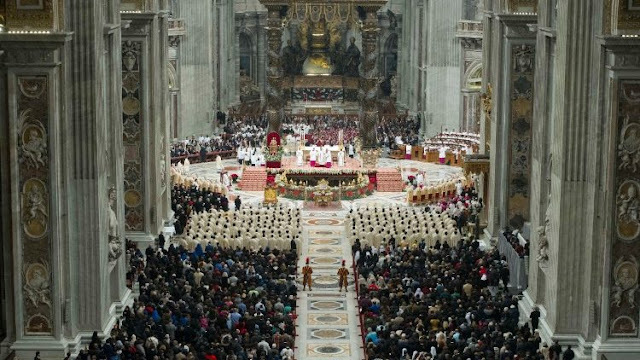 A new, digital organ has been installed in St. Peter’s Basilica for papal celebrations. The Director of the Pontifical Sistine Chapel Choir says it responds both to the Basilica’s practical, acoustic demands and to the liturgical reforms of the Second Vatican Council. “New demands require new solutions,” according to Msgr. Massimo Palombella, Director of the Pontifical Sistine Chapel Choir. His remark refers to the introduction in 2017 of an electronic organ in St. Peter’s Basilica for use during papal celebrations. The state-of-the-art digital organ was donated by the Allen Organ Company, a market leader in the United States for the last 70 years. Msgr. Palombella says the system is able to fill “excellently” the entire acoustic space of one of the world’s largest places of worship. The new organ made its debut on the evening of 24 December as Pope Francis celebrated Christmas Mass During the Night. Despite the presence of this new, digital organ for large celebrations, the traditional – and beautiful – pipe organ remains irreplaceable for events held at the Altar of the Chair. “It is truly perfect for that space in all its breadth, through the real sound of the pipes, without requiring amplification,” Msgr. Palombella said. Up to now, the musical production of the pipe organ had been picked up by microphones and rebroadcast digitally throughout the Basilica and St. Peter’s Square. This method, however, caused inevitable frequency distortion and quite a few problems related to background noise. The problem of filling St. Peter’s Basilica with organ music came about only after the Second Vatican Council. “Before Vatican II,” Msgr. Palombella explains, “papal celebrations were held in the Sistine Chapel, and the problem with broadcasting internationally or using microphones didn’t yet exist. Above all, there wasn’t even a pipe organ. Celebrations in St. Peter’s Basilica took place, and still do, at the Altar of the Chair, and the pipe organ is perfect for this acoustic space. “Following the liturgical reform of the Second Vatican Council, the whole of St. Peter’s Basilica began to be used for celebrations. This necessitated a continuous search for solutions to diffuse high-quality sound. It also required a concerted effort by, first of all, the experts of Vatican Radio – today Vatican Media – Deutsche Grammaphon, and the RAI,” Msgr. Palombella said. As the years march on, needs and technology change and require new solutions. The digital organ of St. Peter’s Basilica is a new way of responding musically to the challenges set out by the Second Vatican Council for a Church willing to dialogue with the contemporary world and always seeking to broadcast the beauty and living reality of tradition.